Available only on 5 oz. tubes. Both Cement & Liquid Forms available from stock. 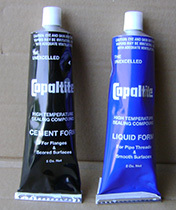 Copaltite Liquid is used for threaded connections and machined surfaces. Normally used without gasket, it can also be used as a gasket dressing as it is a smooth paste that is easily spreadable. Copaltite Cement is for rough surfaces, warped flanges or unfinished parts. Due to it's thick coarse texture, it fills gaps in scored, uneven surfaces.